So you’re a professional or business owner who knows the ins and outs of your industry. You’re good at what you do, and it shows in your products or services. But how do your customers and potential customers know that? How do they find you? The key to building your business’ online presence is search engine marketing. You may be familiar with traditional advertising – including print ads, billboards, TV commercials, radio spots, etc., – but as an online world that’s thoroughly connected through the internet, search engine marketing is where it’s at. Let’s talk about that for a sec. 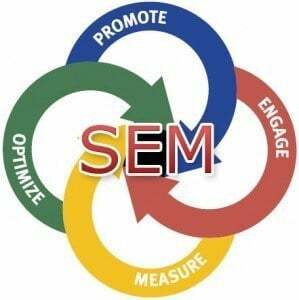 Search engine marketing is basically your ability to become more visible and discoverable to search engines. And even though surfers in India, New York, or Tokyo may use the exact same engine, your potential customers in your city are more likely to discover your business because these search engines are intelligent. And that’s what you have to be too. Effective search engine marketing requires you to really know your business, your customers, and how search engines work. When you are familiar with all three, you can reach the trifecta of search engine marketing: communicating what you do that’s important to your customers in a very findable way. To create a more SEM-centered site, you need both superb organizational structure on your site as well as the ongoing creation of relevant, customer-centered content. When we talk to our customers, we often stress that solid search engine marketing is more than an initiative; it’s a commitment. But it’s one that pays off. We can help school you in the many tricks and tips that make search engine marketing a true art form, but above all else, we want our customers to understand the purpose for SEM so that they can better support an SEM system within their marketing strategy. Like taking out a yellow page ad or displaying directions to your store on a billboard, search engine marketing is all about helping customers who need you to find you – and then become convinced that you have what they need. Ready to find out more? Give us a call today and jump-start your search engine marketing plan.